Known around the world for its arts and theatre scene, its unique cuisine, its picturesque 16th century Colonial architecture, and its seemingly endless stream of festivals, the city of Oaxaca is a popular destination for tourists from all over. We especially noticed a number of French and German speaking tourists, as well as a few gringos; however most of them were older and more “straight-laced” than us. 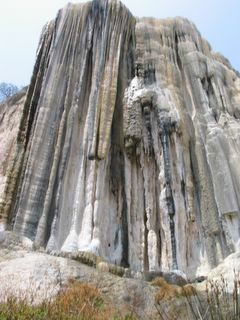 Of course we were here during a very non-touristy time of year, by Oaxaca standards. We also spotted a variety of fashionable and hip college students and an abundance of activist graffiti including “Free all political prisoners!” and “No to Plan Puebla Panama!” During our walks around town, we discovered a hip little club with a live jazz band, and we noticed a number of posters advertising plays and independent films. After the peaceful village of San José del Pacifico and the small beachside towns, however, the main thing that struck us about Oaxaca was its decidedly urban character. Packed full of obnoxious taxis, with honking cars going nowhere in traffic gridlock, major construction making a terrible racket and tearing up the most beautiful part of the city right next to the central zócalo, and even a huge stinking pool of liquid in the street from a previously broken down garbage truck, Oaxaca insisted on showing us its worst. After giving up in frustration on finding an affordable place to sleep in town (even the hostels were too expensive since we’d have to pay for private parking), we ended up staying about 5 miles outside the city, at another one of Mexico’s infamous “no-tell” motels, for a very reasonable price. And yet, with its booming activist and art culture combined with frustrating traffic, Oaxaca actually reminded us a bit of San Francisco, albeit a very Mexican San Francisco. 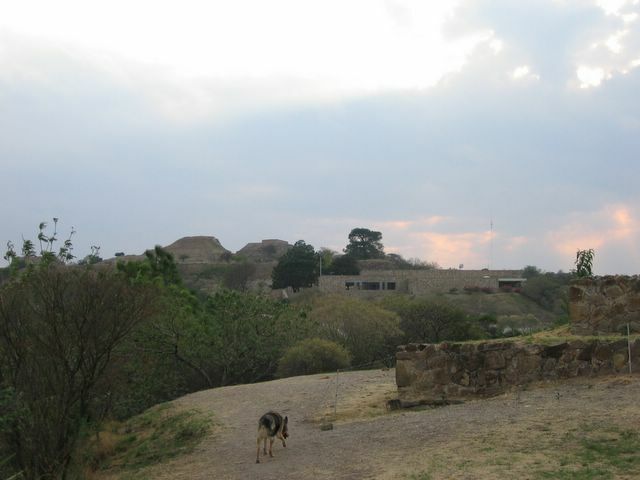 One of the popular attractions just outside of Oaxaca is the ruins of an ancient 12th -13th century Zapotec (indigenous) city now known as Monte Albán. This archaeological wonder sits on top of a large hill overlooking Oaxaca, and we figured it would be a great idea to check it out in the late afternoon and beat the heat while catching the sunset. Unfortunately, the site closes its gates over an hour before sunset, so by the time we got up the hill, we were too late! We briefly enjoyed the view of the city below from outside the gates, snapped a couple of photos of the ruins over on the next hilltop, and congratulated ourselves on not paying the admission fee. What else could we do? 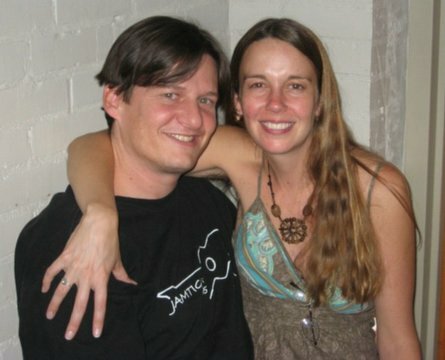 Anyways we figured Monte Albán would pale in comparison to the Mayan ruins we would be checking out next week. After getting fed up with the noise and traffic of Oaxaca, we decided on Thursday that we needed to get back to nature. 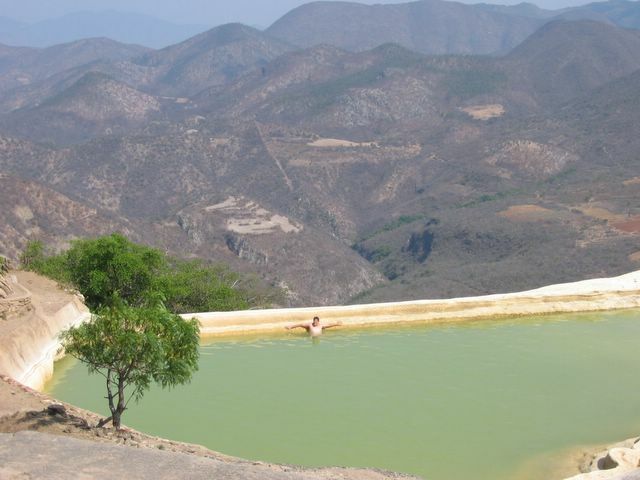 Our Lonely Planet book mentioned a cliff-side mineral bath called Hierve El Agua (water boil), only an hour’s drive east of Oaxaca. 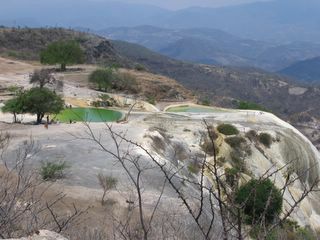 Here a handful of mineral springs (lukewarm, definitely not hot) emerge from some extremely large boulders at the top of a cliff and flow into a couple of large, man-made “baths”, all overlooking a tranquil valley below. 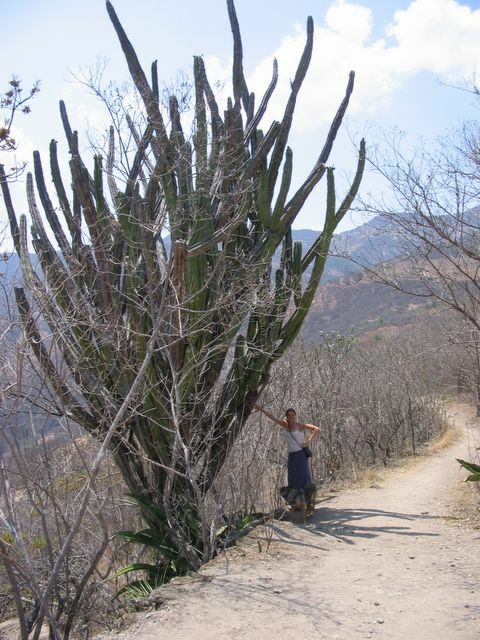 The area is very picturesque and rural, with a variety of desert plant-life, including many cactus and agaves, reminiscent of Arizona. 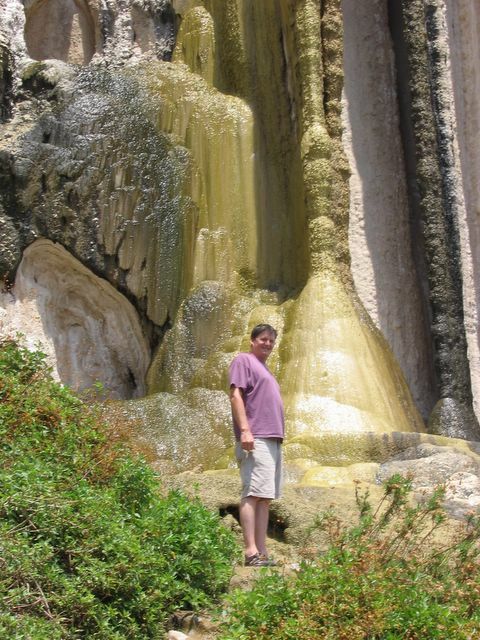 A beautiful hiking trail goes all the way around the site, offering great views from the bottom of the cliffs. 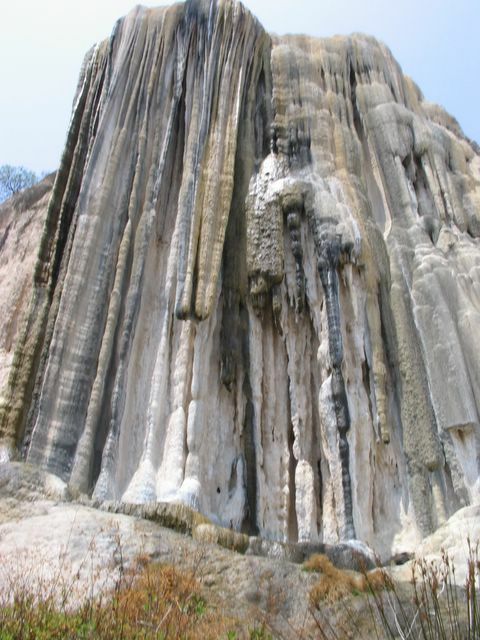 These cliffs are covered with mineral deposits from the water flowing down from the springs above, making them look like giant, frozen, multi-colored waterfalls. The site also offers basic conveniences such as cabañas, a few comedors (food stands, not quite deserving of the word restaurant), and a camping area where we could set up our tent for the night. With nobody but us staying in the campground on this quiet weeknight, we were happy campers. The mineral baths at Hierve El Agua. The springs bubble from the small fenced-in area at the edge of the cliff. 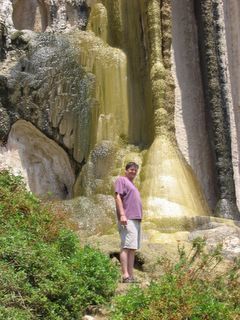 Rob at the bottom of a mineral "waterfall"